In the lab, doctors can attach chemotherapy to nanoparticles that target tumors, and can use nanoparticles to enhance imaging with MRI, PET and CT scans. Unfortunately, nanoparticles look a lot like pathogens - introducing nanoparticles to the human body can lead to immune system activation in which, at best, nanoparticles are cleared before accomplishing their purpose, and at worst, the onset of dangerous allergic reaction. 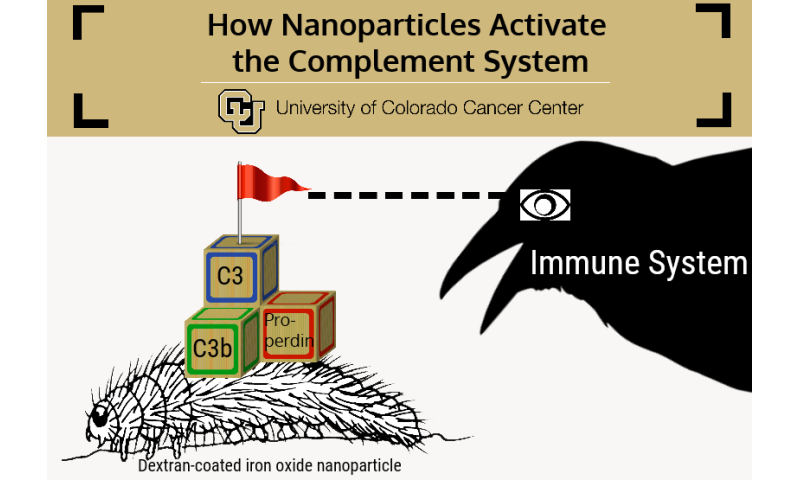 A University of Colorado Cancer Center paper published today in the journal Nature Nanotechnology details how the immune system recognizes nanoparticles, potentially paving the way to counteract or avoid this detection. Specifically, the study worked with dextran-coated iron oxide nanoparticles, a promising and versatile class of particles used as drug-delivery vehicles and MRI contrast enhancers in many studies. As their name implies, the particles are tiny flecks of iron oxide encrusted with sugar chains. "We used several sophisticated microscopy approaches to understand that the particles basically look like caterpillars," says Dmitri Simberg, PhD, investigator at the CU Cancer Center and assistant professor in the Skaggs School of Pharmacy and Pharmaceutical Sciences, the paper's senior author. The comparison is striking: the iron oxide particle is the caterpillar's body, which is surrounded by fine hairs of dextran. If Simberg's dextran-coated iron oxide nanoparticles are caterpillars, then the immune system is a fat crow that would eat them - that is, if it can find them. In fact, the immune system has evolved for exactly this purpose - to find and "eat" foreign particles - and rather than one homogenous entity is actually composed of a handful of interrelated systems, each specialized to counteract a specific form of invading particle. Simberg's previous work shows that it is the immune subcomponent called the complement system that most challenges nanoparticles. Basically, the complement system is a group of just over 30 proteins that circulate through the blood and attach to invading particles and pathogens. In humans, complement system activation requires that three proteins come together on a particle -C3b, Bb and properdin - which form a stable complex called C3-convertase. "The whole complement system activation starts with the assembly of C3-convertase," Simberg says. "In this paper, we ask the question of how the complement proteins actually recognize the nanoparticle surface. How is this whole reaction triggered?" First, it was clear that the dextran coating that was supposed to protect the nanoparticles from human complement attack was not doing its job. Simberg and colleagues could see complement proteins literally invade the barrier of dextran hairs. "Electron microscopy images show protein getting inside the particle to touch the iron oxide core," Simberg says. In fact, as long as the nanoparticle coating allowed the nanoparticle to absorb proteins from blood, the C3 convertase was assembled and activated on these proteins. The composition of the coating was irrelevant - if any blood protein was able to bind to nanoparticles, it always led to complement activation. Moreover, Simberg and colleagues also showed that complement system activation is a dynamic and ongoing process - blood proteins and C3 convertase constantly dissociate from nanoparticles, and new proteins and C3 convertases bind to the particles, continuing the cascade of immune system activation. The group also demonstrated that this dynamic assembly of complement proteins occurs not only in the test tubes but also in living organisms as particles circulate in blood. Simberg suggests that the work points to challenges and three possible strategies to avoid complement system activation by nanoparticles: "First, we could try to change the nanoparticle coating so that it can't absorb proteins, which is a difficult task; second, we could better understand the composition of proteins absorbed from blood on the particle surface that allow it to bind complement proteins; and third, there are natural inhibitors of complement activation - for example blood Factor H - but in the context of nanoparticles, it's not strong enough to stop complement activation. Perhaps we could get nanoparticles to attract more Factor H to decrease this activation." At one point, the concept of nanomedicine seemed as if it would be simple - engineers and chemists would make a nanoparticle with affinity for tumor tissue and then attach a drug molecule to it. Or they would inject nanoparticles into patients that would improve the resolution of diagnostic imaging. When the realities associated with the use of nanoparticles in the landscape of the human immune system proved more challenging, many researchers realized the need to step back from possible clinical use to better understand the mechanisms that challenge nanoparticle use. "This basic groundwork is absolutely necessary," says Seyed Moein Moghimi, PhD, nanotechnologist at Durham University, UK, and the coauthor of the Simberg paper. "It's essential that we learn to control the process of immune recognition so that we can bridge between the promise that nanoparticles demonstrate in the lab and their use with real patients in the real world."